This guest post is published to coincide with the Ecological Society of America conference in Baltimore, MD. Come back for a new post every day through the end of the conference on Thursday, August 13th. Cuba’s Jardines de la Reina (Gardens of the Queen) marine protected area, recently in the news due to the thawing of relations with the United States, is described as a time capsule of the Caribbean 50 to 100 years ago, before widespread degradation of coral reefs by disease, climate change, and overfishing. It teems with sharks and large fish, including the endangered goliath grouper (Pina-Amargós et al. 2014). However, as marine biologist John Bruno underscores in an excellent blog piece, the reefs of the Gardens of the Queen are not immune to the regional decline in coral cover, given their low coral cover (18%) relative to a historical baseline for the region (50% coral cover), and low coral recruitment. Bruno’s finding that Cuba’s celebrated MPA is hardly “pristine” may shock many observers. However, his analysis will not surprise scientists with an appreciation of marine historical ecology, the study of past interactions between people and the marine environment. After all, scientists who value marine historical ecology are trained to look beyond discussions of how marine ecosystems “should look” at present to focus instead on how these ecosystems did look over past centuries or millennia. In that context, virtually no environment can be described as pristine. Rather than merely describing past systems, today’s marine historical ecologists learn from the past to inform conservation efforts. Fishing bans led to the remarkable recovery of fish and shark populations over the past two decades in the Gardens of the Queen, demonstrating the resilience of some marine populations and the effectiveness of no-take MPAs for a diversity of fish species. But just how effective is protection over multiple generations of marine animals? A recent synthesis of population trajectories after the implementation of harvesting bans and other legislated protection shows that some species recover, while others do not; that species with more severe declines exhibit weaker recoveries; and that recoveries often take much longer than 20 years (Lotze 2015). There are countless useful historical examples of how human communities have managed marine environments. For instance, Kittinger et al. (2015) find that the native Hawaiians fished reefs sustainably for centuries prior to Western contact using customary management approaches that included time and area closures, gear restrictions, and social taboos on overharvest and waste. These lessons, collected in a new release from UC Press, Marine Historical Ecology in Conservation by Kittinger and colleagues, are timely for Cuba’s Gardens of the Queen MPA, where the relationship between people and place is on the brink of change, and where the future is likely to hold more intensive tourism, sport fishing, and marine research. Nor is Cuba alone in facing conservation challenges and environmental change that demand time-tested best practices of conservation and management. Kittinger, J.N., Cinner, J.E., Aswani, S., and A.T. White. 2015. Back to the future: Integrating customary practices and institutions into comanagement of small-scale fisheries. In Marine historical ecology in conservation: applying the past to manage for the future. Eds. Kittinger, J.N., McClenachan, L., Gedan, K.B., and Blight, L.K. UC Press. Lotze, H. 2015. What recovery of exploited marine animals tells us about management and conservation. 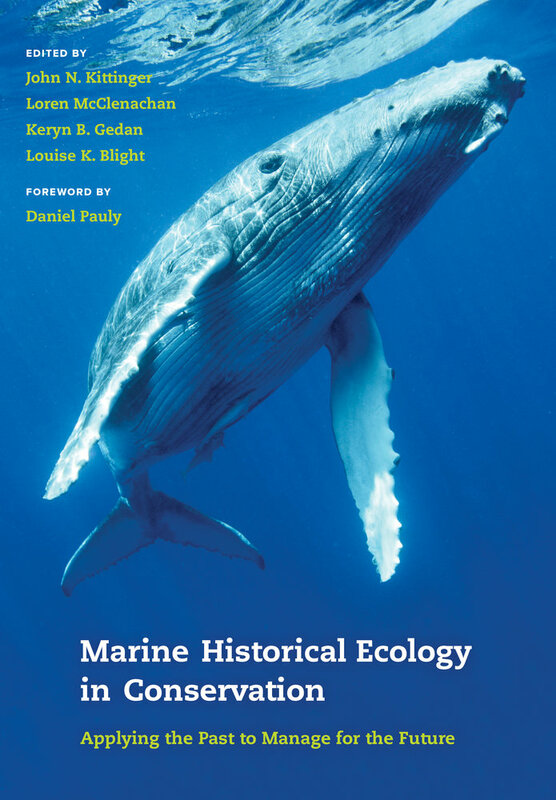 In Marine historical ecology in conservation: applying the past to manage for the future. Eds. Kittinger, J.N., McClenachan, L., Gedan, K.B., and L.K. Blight. UC Press. Getting Ahead of the Endangered Species Act California: Taking Stock, Looking Ahead Pandas vs. Spiders: Mark Moffett Settles the Debate ESA 2014 Is Coming to California!